The webinar will provide an overview of the initiative, CDC's efforts to address hypertension control and an example of a preventive medicine physician participating in the initiative. 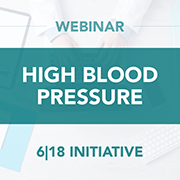 In addition you can also learn about ACPM's current and future learning opportunities in health systems transformation - including the 6|18 Initiative.The webinar will provide an overview of the initiative, CDC's efforts to address hypertension control and an example of a preventive medicine physician participating in the initiative. In addition you can also learn about ACPM's current and future learning opportunities in health systems transformation - including the 6|18 Initiative.